In honor of my birthday, July 28, I’m again providing a new free pattern for your enjoyment. This year’s pattern, available for a limited time (so be sure to download or save it now because you never know when it may disappear and no longer be available). Click HERE to get the pdf file of the pattern. Please share a photo if you make this quilt – I’d love to see what you do with it. Thank you for this beautiful pattern and best wishes to you birthday girl! Thank you and happy belated birthday. I do plan on making it but it will be awhile. I ONLY have 5 quilts (that I am working on, we won’t talk about the UFO’s) started plus 4 block of the months. Have a wonderful day!! Fantastic and adorable Flitterin’ pattern. Thank you for sharing your marvelous creations. Thanks soooooooooo much sweet lady! Thank you for the pattern and also Happy Birthday. I love the crayon border on this page. It got me thinking that if it were made into a table runner it would be a wonderful teacher gift. Will it be available anytime soon? Keeping my fingers crossed that it will. Thanks – glad you like the crayon quilt — but can’t give you a time table. VERY PRETTY. HAPPY BIRTHDAY TO YOU. tHANKS FOR OUR BIRTHDAY SURPRISE. Happy birthday and thanks for sharing your beautiful quilt!! Thanks so much, Denise. And a very Happy Birthday to you! Happy birthday! Thank you for the beautiful pattern. Thank you, hope you have a wonderful birthday! Thank you so much for the pattern. I have EQ7. My guess is that you were born at 1:15am. Happy Birthday. Thank you for the quilt pattern. Thank you – this is a beauty that I’ve got to make! Thanks so much for the flitterin’, flutterin’ butterfly…so pretty. I have EQ7 although my computer is giving me fits right now and I can’t work on it. My guess is 3:02 pm. What a lovely pattern! Happy Birthday to you! I hope you get some great gifts for you b-day and thanks for the lovely gift to your readers! Happy Birthday and I love the pattern, especially with the colors you used. Thanks! Thank you so much! AND, Happy Birthday! Happy Birthday! Thanks you so much for the cute pattern. Happy Birthday, Denise. And thank you for the pattern it is wonderful. Happy Birthday, Denise. Thank you so much for this pattern. I love butterflies. Merci Denise et Bonne Fête! Happy birthday & thanks for the pattern. Happy Birthday to you and thank you for the pattern. I really like the border on this pattern. Hope you have a great day. Happy Birthday to You! I just love the colors of your Butterfly. Jewel tones are my faves. Love Butterflies as well. Thankyou for the awesome gift. Happy Birthday, Denise. You are so creative with all your patterns. I will enjoy making this sometime in the future. I use EQ7 and love it. I used it to make my own Beginning Quilting book for the class that I teach in AZ. I would guess that you were born somewhere around 10 am. Thank you for the pattern. Hi, Denise! Thank you very much for sharing this pattern with us! It’s so beautiful! Have you a very Happy Birthday! A big hug! 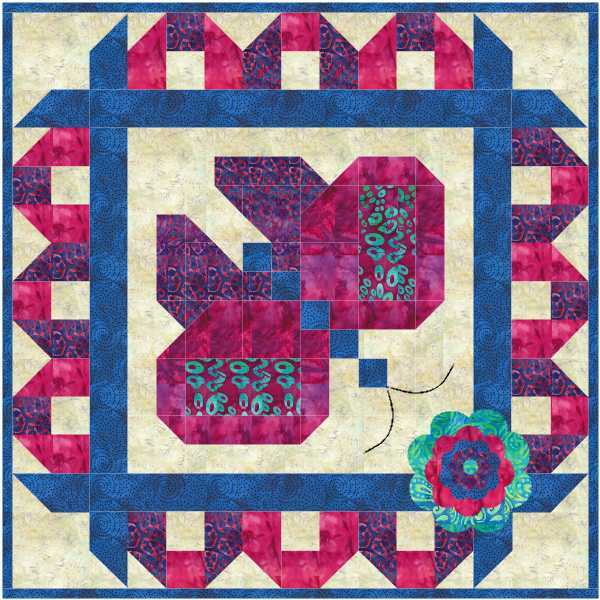 Happy Birthday Denise, what a beautiful pattern and thanks for sharing! Happy birthday Denise and thank you! Great pattern! Happy Birthday, Denise! Let’s say you were born at …… 6:03 pm. Ok, now I use EQ7 faithfully! I began with verEQ4 and upgraded every time. What’s not to love about EQ?! Thanks for the free pattern file. I especially love the border. Happy Birthday to YOU!! Thanks for the pattern. CUTE! Thanks, Denise! Happy birthday! And many more, by the way, lol. Happy Birthday Denise… and thank you for giving US a present for your birthday! Thank you–I love it! Happy Birthday! !